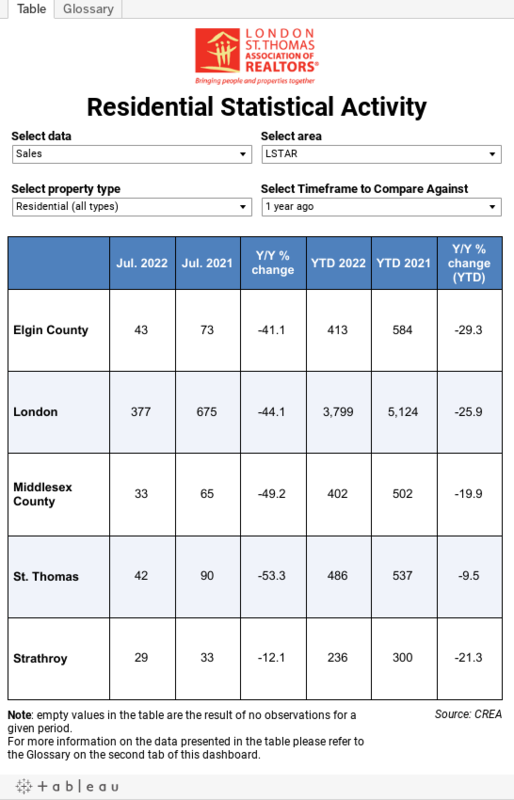 London and St. Thomas Association of REALTORS® (LSTAR) announced 525 homes* were sold in January, up 17.4% over January 2018. The number of home resales was higher than the 10-year average, with the second highest number of units sold in January since 2010. "We're starting to observe signs of movement toward more balance in the marketplace, based on the sales-to-new listings ratio," said Earl Taylor, 2019 LSTAR President. "In January, the ratio was 60.9% across LSTAR’S jurisdiction. The Canadian Real Estate Association (CREA) says a ratio between 40% and 60% is generally consistent with a balanced market." Bucking the trend was St. Thomas, who saw a sales-to-new listing ratio of 80.3% in January, which CREA says represents conditions in the marketplace that favour sellers. St. Thomas also achieved a new high in the last 10 years with its average home sales price. "In January, average home sales price in St. Thomas was $343,178, up 34% compared to January 2018," Taylor said. "Going further back, that's up 68.9% compared to January 2014 and up 86.7% compared to 10 years ago." Average home sales price made steady gains in the five major areas of LSTAR's region. In London, the average sales price was $387,859 up 11.2% from last January, while it was $398,150 in Strathroy, an increase of 41.4% from January 2018. "Looking at specific geographic areas, London North had an average of $477,615, up 18.1% from the same period last year," Taylor said. "In London South (which also includes data from the west side of London) had an average sales price of $381,120 in January, up 6.6% compared to January 2018 and up 95.8% compared to just 10 years ago." According to a research report1, a total of $67,425 in ancillary expenditures is generated by the average housing transaction in Ontario over a period of three years from the date of purchase. "The business of real estate has a long-term tremendous impact for the region," Taylor said. "For just the first month of the year, we're talking about generating potentially more than $35 million into the local economy over the next few years. This impacts government, professional services including legal and appraisal entities, furniture and appliance manufacturers and retail, as well as local contractors and tradespeople." *These statistics are prepared for LSTAR by the Canadian Real Estate Association (CREA) and represent a data snapshot taken on February 1, 2019, based on processed home sales activity between January 1 and 31, 2019.